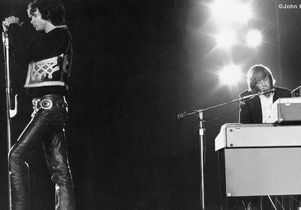 Morrison and Manzarek at Hollywood Bowl in 1968. The year 1965 was a historic one at UCLA. Martin Luther King Jr. stood at the base of Janss Steps delivering words to inspire unity and civility in the face of racial unrest, Pauley Pavilion opened its doors, and UCLA created a new archive that would come to hold nearly 500,000 film and television assets earning the campus renown as a preserver of the nation’s news and entertainment history. That year was also a turning point for Ray Manzarek and Jim Morrison, two UCLA film school graduates who would pivot their creative energy from the silver screen to stages and recording studios as founders of the iconic rock band The Doors by year’s end. The pair, who met on campus when Morrison was a senior and Manzarek was a graduate student, became household names by the late 60s, along with bandmates Robby Krieger and John Densmore, and their early artistic endeavors as movie makers are at risk of being forgotten as time takes its toll on the original reels. With this in mind, the UCLA Film and Television Archive launched the Ray Manzarek and Jim Morrison Preservation Project. The campaign being conducted on UCLA Spark, UCLA’s crowdfunding platform, began Feb. 12 on what would have been Manzarek’s 80th birthday. It closes April 1. To date, nearly $40,000 has been raised. “Evergreen,” a film produced by Manzarek, and “Five Situations,” a film for which Morrison did sound, will be the first two films to be restored. Any additional funds will support the preservation of Manzarek’s film “Induction,” as well as “The Blind Man and the Wino,” which stars a nearly unrecognizable Manzarek as a blind man with a beard, and “Patient 411: A Progress Report,” which features Morrison’s camerawork. “The films that Morrison worked on are interesting to see because, of course, he became a sound person making music and recording albums,” said Horak, of the songwriter and vocalist who died in 1971 at age 27. 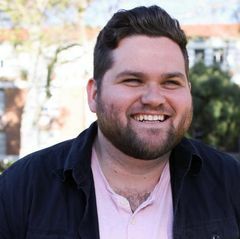 This project will allow staff in the UCLA Film and Television Archive to clean the films and transfer them from fragile 16-mm prints to high-resolution digital cinema packages, which have become a global standard format given to commercial theaters for screening, and film masters, Horak said. The restored films are slated to be screened at the Billy Wilder Theater inside the Hammer Museum at UCLA, along with a collection of other student films made by notable alumni, as part of the UCLA’s upcoming year-long 100th anniversary celebrations. This is the third crowdfunding campaign the UCLA Film and Television Archive has launched in recent years to support its work. Recent campaigns supported the preservation of a Laurel and Hardy collection and funded the 2019 Festival of Preservation. Fujikawa met Manzarek in 1961 during her first semester as an art major. 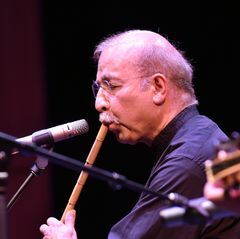 A graduate student, Manzarek had enrolled in a drawing class that Fujikawa was also taking. “He wanted to make storyboards like Sergei Eisenstein,” said Fujikawa, referring to the Soviet film director and film theorist who pioneered the use of montage. 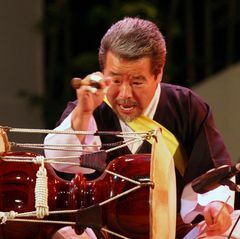 Fujikawa recalls attending a play on campus with Manzarek shortly before his studies were halted due to military service. He wrote letters to her from Okinawa, and when he returned to school in 1963, they resumed their relationship and soon moved into an apartment in Venice, she said. 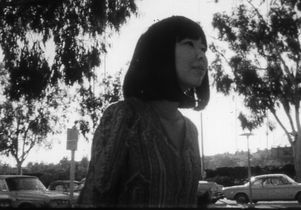 Although Fujikawa had left her studies at this point, she frequently came to campus with Manzarek and sat in on his film classes. The couple spent a lot of time in the film school’s editing suites, getting food from the Gypsy Wagon, a trailer near Bunche Hall that served grill-style fast food, and hanging out in The Coop, a coffee shop that was located in the student union building near where Carl’s Jr. and Bruin Buzz are now. It was there that a mutual friend introduced her and Manzarek to Morrison. Fujikawa and Manzarek also attended classroom and public screenings of new and not-yet-released movies. 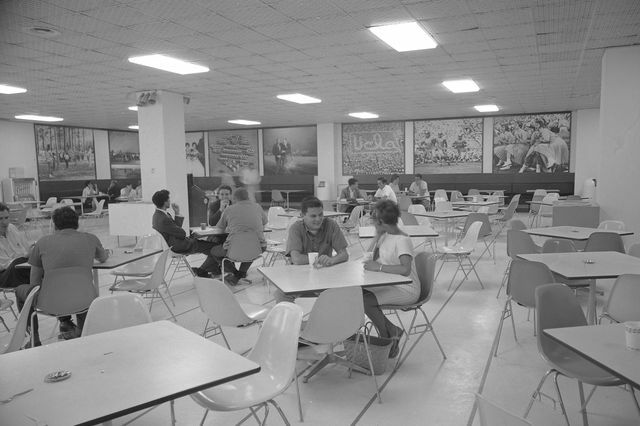 The Coop, a coffee shop that was once in the Ackerman Student Union building, is where Jim Morrison met Ray Manzarek. This screening room was also where film students would reveal their projects and be critiqued by their classmates and professors. It was there that Morrison’s student film, which no longer exists, had its first and only showing. 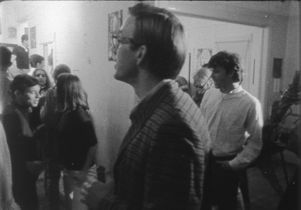 In those days, UCLA retained all the rights to student films because the university paid to produce the projects and the only ones that were kept by the university were those selected for the Royce Hall Screenings, a twice-a-year public showcase of the best student-produced films. Morrison’s didn’t make the cut. 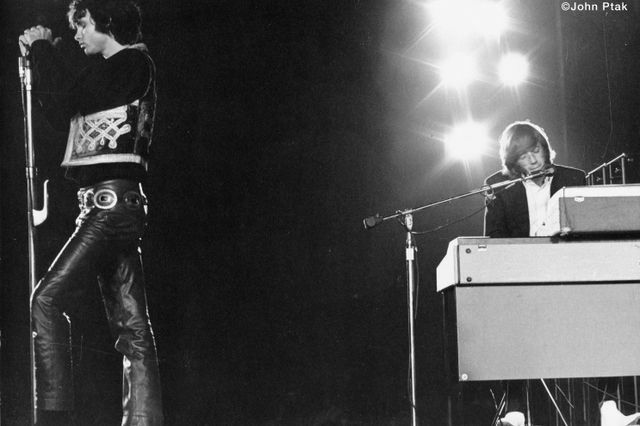 Jim Morrison and Ray Manzarek of The Doors at Hollywood Bowl in 1968. Previous Story UCLA aflutter over the butterfly effect Next Story Kinkajous, porcupines and sloths, oh my!